Over 50 videos containing all the information you need to master music theory. 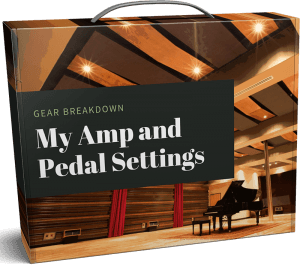 There is more than 6 hours of video content where I go over each section of the course in detail and explain all concepts using a visual presentation and applying the concepts I talk about to the guitar and also the keyboard. I try to break everything down to make it as simple, interesting and easy as possible and to follow, because I know how easy it can be to completely tune out of music theory. Each of the 5 ‘sections’ of the course or ‘mini-courses’ include their own PDF ebook. We cover everything that’s in the PDF ebook in the videos themselves, but you will also receive the actual presentation ebooks so that you can look at the concepts yourself, print out the book to refer to, or just have easy access to at any time throughout the course. This 161 page resource ebook is a ‘reference’ book so that once you finish the course and understand all the concepts in the course, you will be able to look back on this resource ebook and check any chord, scale, table, diagram or concept and quickly find what you are looking for without having to go searching through the videos and pdfs. Your course ‘notes’, so to speak.